Okay, it’s that time of the genealogical year when some folks (gasp!) are getting distracted from their family history. Whatever the cause, whatever the distraction, it can be hard sometimes in August to keep our eyes on the genealogical ball. But dropping that ball can hit us in the pocketbook when we do things like overlook the sales that sometimes spring up in August — like the ones going on right now for DNA tests. 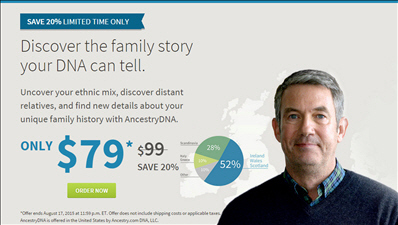 AncestryDNA has a sale doing on now on its DNA test that’ll save you $20 off the regular price of $99. So if you’re heading off to a family reunion this August, or some other family gathering where those aunts and uncles, parents and grandparents will be gathering, you can get — say — six kits for the regular price of five. That should be enough to get you started tracing those family lines. Head over to AncestryDNA for more information or to order. The sale ends August 17th. Meanwhile, over at Family Tree DNA, there are coupon codes you can use for terrific savings not only on autosomal tests — called the Family Finder test at FTDNA — but on the other more expensive YDNA and mitochondrial (mtDNA) tests that only FTDNA offers. • CJS2015 works to apply a 15% discount to any order of $99 or more. So the usual $99 Family Finder test would be $84.15. $140 or more. So you want to do some math here. For the 37-marker YDNA test, usually $169, this code gets you down to $139, while the other code would only bring the price down to about $143. But for the 67-marker YDNA test, usually $268, this coupon gets you down to $238, but the 15% coupon would drop the price to just under $228. So try both codes and see which one is the better deal. The FTDNA coupons work for all tests — autosomal, YDNA (the kind of DNA only men have that is passed down from father to son so is useful in researching our direct paternal line4) and mitochondrial (mtDNA, the kind we all have but that is inherited only from our mothers so is useful for studying our direct maternal line5). And it looks like these coupons are good through August 15th. Head over to < a>Family Tree DNA for more info or to order there. So… what are you waiting for? C’mon… I need more cousins in these databases! The CGS30 code works on $139 too. If you already have a sample at Ftdna, and order through a project, a 37 marker Y-dna test is $139. I was able to use the $30 coupon to get it for $109! Outstanding! Most of the American projects haven’t yet been added to the list but it’s pretty comprehensive for the rest of the world. Absolutely correct, and thanks god the reminder! Also, an ad shows up on my FTDNA homepage now for a specialized 140 SNP test for M-343 downstreams. I haven’t the faintest idea what that means, but it’s only $99 so it can’t be all bad.